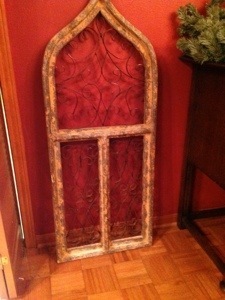 This interestingly shaped arched window was purchased at a garden center in the heart of Gruene, Texas, about two years go. I thought it would look magnificent in my bathroom where I had a vertical blank spot. Actually all the walls were quite barren as I hadn’t decided what to decorate with in that bathroom. I couldn’t stand the idea of sea shells or a water related theme. It seems so mundane and overdone to me for a bathroom. I wanted something else. At the time I found this frame, I thought it was unique and one of a kind. Since then, I have seen this window and some that are very similar at different gardens and nurseries in Texas. They are really interesting to me though. I love the idea of a window and the concept of framing things in the imagination. With a blank window on a wall, you can put anything you imagine in your mind into that window. Being a romantic and a reader, I would imagine all kinds of things in that window each time I looked at it.